Application Menu - The application menu for EDP contains application functionality for Opening EDDs and Formats, Saving EDDs and Reference Values (Professional), Sign and Submit, Register, Application Options and Information. Home Ribbon - The EDP Home Ribbon provides single button access to opening EDDs, Formats, Error Summaries and Logs, Data Viewing options and EDD Tools, such as Blank EDD and EDD Description. 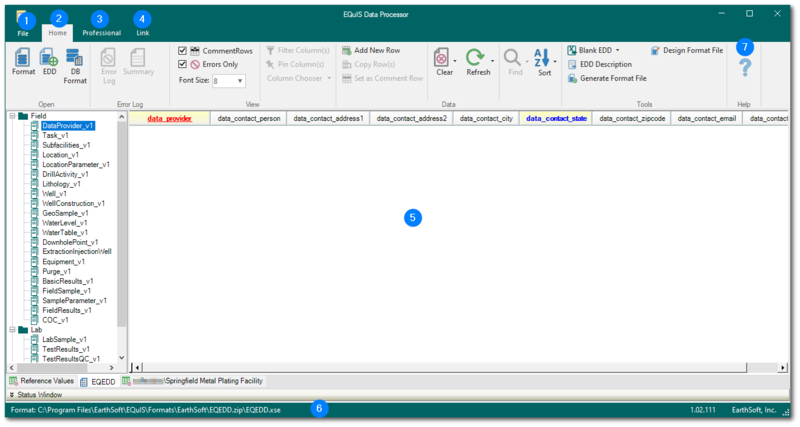 Pro Ribbon - The EDP Pro Ribbon is available for EDP users launching EDP through EQuIS Professional and provides some analysis tools, tools for importing the data package into the EQuIS Database and Export options (for formats with an EDD export). EDP Workspace - The EDP Workspace displays the EDD sections on the left (i.e. EFW2FSample, EFW2LabSMP, EFW2LabTST, EFW2LabRES, EFW2LabBCH for the EFWEDD format), the data grid to the right of the sections as well as the reference value tabs, EDD tab and Package Tab along the bottom. Format Information Bar - The EDP Information Bar provides information to the current EDD format open, such as the path to the format, the format's file name as well as the version and the author. Help - The Help Button ('?') will open up context sensitive help from within EDP to the EarthSoft Online Documentation.